Radish is one of the nutritious root vegetables featured in both raw salads as well as in main recipes. This widely used root vegetable belongs to the family of Brassica. In Chinese culture, radish along with cabbage and soybean curd (tofu) believed as healthy and sustenance food items. A popular Chinese proverb goes like this, "eating pungent radish and drinking hot tea, let the starved doctors beg on their knees." (Raphanus sativus). Winter daikon displayed in a market. 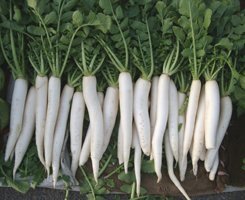 The sharp, pungent flavor of radish comes from "isothiocyanate" compound in them, varying from mild in the case of white-icicles to very hot in the red globe and other pigmented varieties. Tender top greens of radish are also eaten as leafy greens in some parts of the world. Black spanish radish. Green Chinese (lobok) radish. Purple varieties. They are one of very low-calorie root vegetables. Fresh root provides just 16 calories per 100 grams. Nonetheless; they are an excellent source of antioxidants, electrolytes, minerals, vitamins, and dietary fiber. Fresh radishes in a market. Korean- radish. Note for its large size. Watermelon radish slices. Photo courtesy: Neeta Elongated red skin radishes. In North India and Pakistan, the root is grated and mixed with spice and seasonings and stuffed inside bread to prepare "mooli parantha." Radishes may contain goitrogens, plant-based compounds found in cruciferous and Brassica family vegetables like cauliflower, broccoli, etc. Goitrogens may cause swelling of the thyroid gland and should be avoided in individuals with thyroid dysfunction. However, they may be used liberally in healthy persons. (Medical disclaimer). <<-You may also like to read- Black radish nutrition facts and health benefits. <<-Back to Vegetables from Radish. Visit here for an impressive list of vegetables with complete illustrations of their nutrition facts and health benefits. Antioxidant Functions of Sulforaphane: a Potent Inducer of Phase II Detoxication Enzymes J. W. FAHEY and P. TALALAY.